For part three of this series, I want to let you know about a site that I absolutely adore: The Doorposts Blog. I first came across Doorposts about two years ago. A friend had mentioned starting the Doorposts series that was titled “30 Days of Child-Training Bootcamp for Busy, Busy Mamas“. The title was intriguing to me — someone out there who understood how hard it is for busy moms to read the Bible! And, I knew that my child-training skills could desperately use some guidance (anyone else??). So I signed up for the free lessons via email, to see what the study was all about. And… my experience with this first study was phenomenal. I love the writing style that Pam uses to communicate to her readers, first of all. I feel like I’m listening to an older, wiser, Christian mom share her years of child-rearing advice over a cup of coffee (she has six grown children now) – which she learned straight from the pages of the Bible. At the same time, I don’t feel like any truth is spared in these studies. (Read, “It’s Possible to Be a Mother and Still Study Your Bible“, for example.) I am constantly challenged to re-examine the way I view God/Jesus, myself, my children, my marriage and the world in general – all in light of what the Bible has to say on these topics. After doing that study and more since then, I can say that the authors of this site have done an amazing job breaking down the Bible, topic by topic, verse by verse, using study helps, repetition, memorization, writing exercises and reflection to really help the Word sink into my core- where it needs to be. That brings me to another great resource that goes right along with the Doorpost studies. (You’re getting a two-for-one “favorite study tools” in this post today). The Doorpost Blog uses the Blue Letter Bible to dig deeper into Scripture. You can download the free app (for Android or iPhone) and use this awesome resource side-by-side with the Doorpost studies. 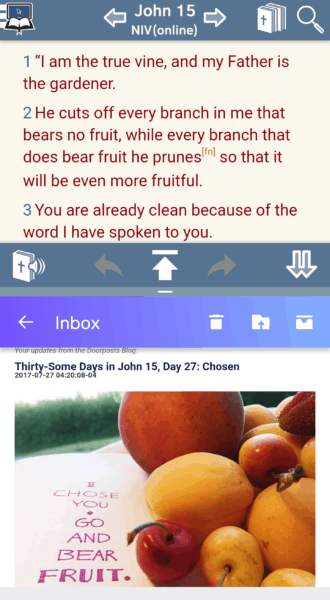 (Below is a screenshot of what it looks like when I’m doing the side-by-side view on my phone with the Blue Letter Bible and the email open from that day’s lesson). I could do an entire post just on the Blue Letter Bible, but if you’re not familiar with it, I really suggest using it along with one of the Doorposts studies to really understand how to use it better. It’s great for looking up Scripture in general, but there’s SO much more to it – and I wouldn’t have really grasped the best way to utilize it – without the explanation Pam provides in her lessons. In each lesson, the author tells you exactly what chapter or verses to look up and then takes you step-by-step through the Blue Letter Bible, using its cross-reference, Interlinear, translation comparison tools, text commentaries, and dictionaries. She gives you questions to think and write about as you read. As you go through the study you become more independent in learning how to use the Blue Letter Bible on your own. If I had a big library of all of these commentaries and dictionaries contained in the BLB, I would probably feel totally overwhelmed and unsure of where to start. But when I’m in a Doorposts study, it’s really simple to use these study helps and have a deeper understanding of the Bible. You will also use your physical Bible for these studies and it’s a good idea to use one that you don’t mind marking in, highlighting, and drawing symbols and pictures in. I guess I’m a rule-follower by nature and I have never liked to write much in my Bible (go figure! ), but after reading Pam’s explanation here of why it’s beneficial to have a Bible that you can write in, I have to agree that there’s nothing wrong with it (and it’s quite beneficial)! If you decide to sign up for a Doorposts study, you can also join the Busy Mamas Bible Study Facebook group to connect with other moms learning along with you.